If you need help with the cleaning of the hard floors in your property, rely on our employees to provide it. 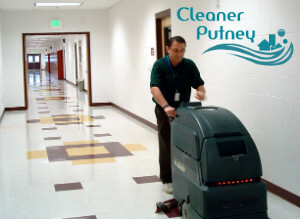 We offer professional hard floor cleaning which can be used by property owners and landlords for the Putney SW15 area. Rely on our cleaning technicians to take care of the spotless state of the tile, linoleum, marble, wood and other floors which you have. Our staff are trained to work with rotary machines on high and low speed, to buff and polish the different hard floors. They can return the glamour and attractive state of the floor coverings in your property. The hard floor cleaning which we provide ensures effective and complete removal of stains, dirt, scratches and soiling. Our technicians inspect the area in advance and choose the most suitable procedures for it. They work with high-end rotary machines, various mopping tools and efficient cleaning solutions. After dry or wet cleaning and mopping the floor, our staff polish or buff them using advanced machines. The rotary machines which they utilize ensure effective and thorough removing of dirt, hard stains, grime and soiling. The polishing protects the floor from damaging as it is performed with rotary machines working on low speed. The buffing ensures restoring of scratches being performed with the help of machines that work on high speed. Reserve a free inspection of your floor area and get your personalised quote. The hard floor cleaning which we provide in Putney is professional and inexpensive. We offer professional cleaning of all types of hard floors: terrazzo, slate, wood, marble, slate, granite and so forth. Get in touch with us to book the hard floor cleaning which you need in your estate, located in SW15 Putney and you will be pleased with the result.